Here we have another “truly” handcrafted sonic masterpiece from the workshop of G.W. Barry, a ‘Mod-C Ziricote’. This instrument is passing through our shop on the way to its new owner, and it looks so good we wanted to share it. 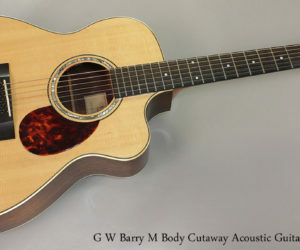 This is Mr. Barry’s Modified Concert model in Bear-claw Sitka Spruce and Ziricote. With a 15.5 in. lower bout width and 4.25 in. 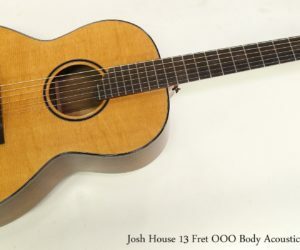 tail end depth the Mod-C bridges the gap between a standard OM and Dreadnought dimensions, while its curvaceous lines add an ergonomic comfort factor when in a seated playing position. 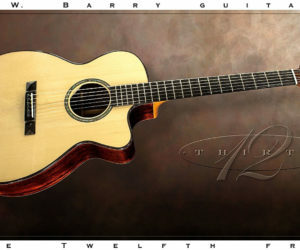 G W Barry, like many other of the current top shelf Canadian luthiers, apprenticed in Jean Larrivee’s shop and this shows in the careful selection of materials and quality of construction. 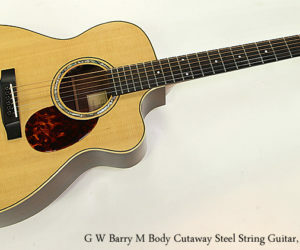 This G W Barry M Body cutaway guitar was built in 1997 and has recently had a neck reset and new saddle, and has an LR Baggs pickup system. 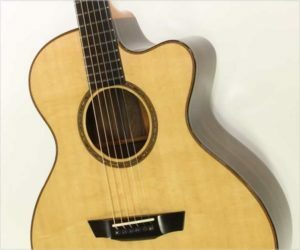 We’re featuring the third guitar from the G.W. Barry 30/12 collection. 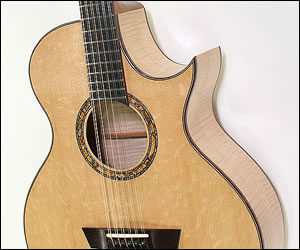 This particular guitar has an interesting history and compelling visual features.